“Axe is all about effing: **** Chuck! **** Carly, Channing and Hlasa! **** Eads Family! Hey, he even wants to say **** You to gravity! It is his “**** you money” that gives him the power to do it and Axe perfectly sets the tone in The Pilot with my favorite line of the show: “What’s the point of having **** You Money if you never say **** You?” And, besides, it is very personal. February 3, 2015: Exactly four years ago. The blog is just one month old and I am dying to find a way to tell Damian Lewis about it. But how? You know he is not listed in the phone book 😀 So when I find out on Twitter they are shooting Billions in midtown NYC and just ONE subway station from our apartment… Well… Nice! The only downside is that it is one of those sunny but freezing mornings with temps in teens! Is it really worth going without even knowing if there is a slim chance of seeing your favorite actor? But then again what’s the point of having a fan blog for him if he never finds out about it? 🙂 Fair enough. Lewisto and I put on our warmest puffy jackets, complete with hats, gloves and boots, and off we go to Billions set! 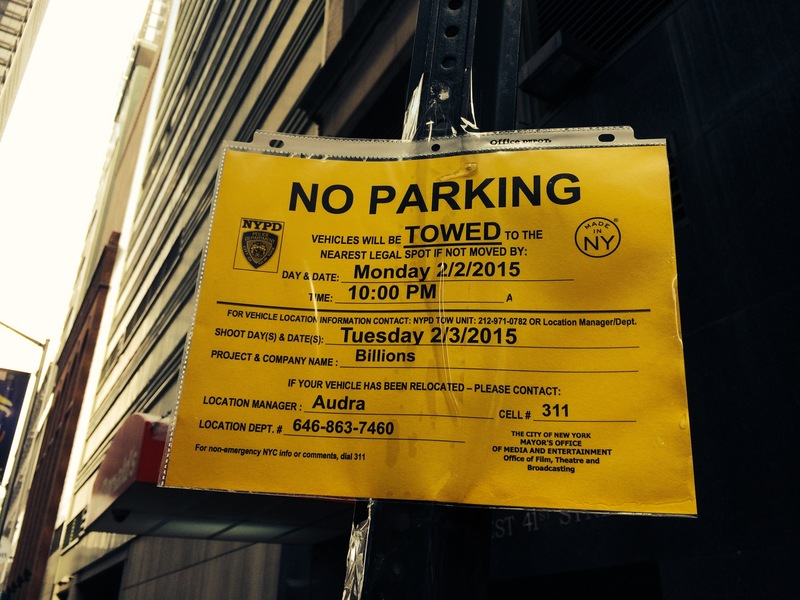 First, we notice the yellow NO PARKING signs on the street… Honestly, I never noticed them before… until I found out they are posted by film crews. Lo and behold, I am an expert now! They film indoors at New York Times Center which I blogged about in our Billions NYC locations post. We need to wait outside and keep fingers crossed Damian will get out for some fresh air or food catered set up outside on the sidewalk. That is our one chance. We see many extras, men and women in nice business suits, and with badges saying Delivering Alpha on them. I have no idea then about what Delivering Alpha is about. Now I know it is an annual conference hosted by CNBC (please note Andrew Ross Sorkin, one of the Billions Season 1 executive producers is also a co-anchor on CNBC’s pre-market morning news program Squawk Box) and Institutional Investor and held in New York City. We, in fact, have hedge-fund titans Bobby Axelrod (Axe Capital) and Steven Birch (Piedmont Capital) on a Delivering Alpha panel discussion in the Pilot! Back to us standing in the cold… The catering staff is the sweetest people in the world that deserve a special mention here. They offer us tea/coffee, and food; in particular one of them even offers us her hand warmers! In the meantime, Paul Giamatti comes out for coffee, David Costabile comes out for food… On a regular day, I’d go say hi and even ask for a picture, but I cannot even think about it now. I mean… Paul F***in’ Giamatti is standing next to me having coffee, and I don’t even say hi? And I love him! But I am glued to the glass windows keeping an eye on what’s going on inside… The catering staff has been working on the set for a while now, so they know everyone. And, they say “the tall guy” is rarely coming out. Ok. It seems we will have a longer wait than we thought we would. Confession: We, give or take, waited for 10 hours. So when I hear “10pm” I am ready to leave. And, Lewisto says, “Ok, you go… I will wait.” Seriously? And, we wait… taking turns going to the New York Times Building nearby for 10 minute breaks to indulge in its wonderful heater… And at some point we buy hand and foot warmers as well. What a day! I am glued to the glass window. I see Toby Moore and Condola Rashad at the head of the stairs. They are obviously shooting downstairs. Remember the scene downstairs at NY Times Center? Yes, you do! And… touchdown! All of a sudden, it’s me, Lewisto, the catering staff and Damian Lewis on the sidewalk. Damian asks about the ribs, someone told him they were good, alas they are all gone. And I am sending my heartfelt thanks to the person who recommended the ribs — whoever you are, you made my DAY! I know from what I read earlier that Damian likes to stay in character on set but now I understand what THAT means. This is the hedge-fund king standing next to me studying the food table. So I properly introduce ourselves and tell him about the blog. One can tell he’s a little bit puzzled that a college professor is doing a fan blog for him. But, believe me, this is not much different from thinking about Jean Jacques Rousseau and his work, and write about it. And, honestly, it is much more fun to think deeply about Damian Lewis and his work and write about it. Then he is not Bobby anymore… but still in American accent. I tell him about Fan Fun with Damian Lewis and he seems to be intrigued. He is very kind and generous with his time, he asks for my information and puts it into his jacket pocket, asks about our jobs, what we teach, and in fact, poor guy cannot get to eat anything because he talks to us until someone comes to say he has to go back for the shoot. I don’t know if Damian ever read that post. But if you want to read it, it’s here. Thanks for sharing this (again). I have only recently come across this blog very much! I am very impressed with your dedication to meet him and so happy for you that it worked out in the end! I was lucky enough to meet Damian after his performance in The Misanthrope in London in 2010 and he very kindly signed an autograph for me (he even spelt my name correctly without asking – impressed!) and I got the chance to tell him that we share our birthday (albeit he is a year younger than me!). My knees were shaking so much during that brief encounter! Thank you, Sabine, for your kind words and for reading us! So you share a birthday with Damian? LOVELY! And this makes you my fellow Aquarius, too! It’s the first time I read this story…I loved it! What a team with Lewisto. Great guy!!! It’s so fun the first line that Damian says to you, it definitely feels like Bobby. Love your dedication, passion and enthusiasm. I am sure he did read it!!! Thank you! I totally agree Lewisto is the best partner-in-crime 😀 This blog would not have existed without his constant encouragement. Greetings from Poland 🙂 !!! Thank you so much for this lovely note! We could not be happier if we contributed a little bit to the inspiration! But you know what? Your English is perfect and we would love your feedback on the blog. Please keep it coming. Sending hugs and kisses to Poland! “See” you soon 🙂 ! Awww thank you so much – you could not make us happier! “See” you soon then 🙂 Long live Damian sisterhood! Oh yeah the confidence Damian has got once he knew I was blogging about him 😀 😀 😀 Thank you for all your support my lovely lovely friend! Love this – so jealous!! Previous Previous post: Celebrate Damian’s Birthday Month with us on Twitter!